If the British Empire can be loosely defined in this sprawling show it is in terms of ‘ornamentalism’.4 Rather than focusing on the violence of racial prejudice and segregation or the insurgent potentialities of the subaltern (articulated variously by Ranajit Guha, Gayatri Spivak et al) David Cannadine, author of Ornamentalism (2001) claims that the British Empire celebrated class as the modular dynamic for ruling empire. This necessarily privileges an aspirant sahib-elite view characterised by high tea, pith helmets and grandiose ceremonials with their bizarre, excessive often tacky, anachronistic uniforms, ‘fancy dress’ banners or gaudy, patriotic medals. Where are the millions of prints, adverts of ‘commodity racism’, (Pears soap et al) and the chromolithographs that championed Hindu gods as divine embodiments of anti-colonialist allegory?5 British imperialism had an invidious, almost subliminal and an everyday quality. Its culture industry pertained to the newspaper, the commodity label, the postcard.6 Colonised peoples across the globe appropriated an extraordinary range of modern visual technologies to fashion insurgent art forms. Few such images feature in ‘Artist and Empire’. So Tate’s focus on the visual trappings of ornamentalism necessarily has its limits. It is unclear throughout ‘Artist and Empire’ what kind of agency art objects acquired, aspired to or subverted. ‘What did pictures want?’10 Surely they were/are more than mere illustrations of events/epochs as the show seems to suggest. The very materials employed by artists –cochineal, indigo, cow urine, jute, poppy oil, tropical woods, ivory, affirm that painting co-opted in the imperial re-engineering of the eco-systems and aesthetic-economic production of landscapes in north America, the Caribbean, India and the Indian Ocean region.11 It’s also pretty certain that many Europeans’ worldviews were far more imperial than perhaps even they realised. Back in the 1980s, Timothy Mitchell proposed that imperial images, collecting and display determined the worldview of Western European modernity – a worldview seen as aesthetic incarceration, as a ‘labyrinth without exits’.12 In his reckoning, the visual materials of empire were critical to the production of a proto-Society of the-Spectacle. Displaying rather second rate largely obscure British oil paintings which through sheer sensation or claims to reportage has long been problematic. Plagued by poor visitor numbers and funding issues the Empire and Commonwealth Museum in Bristol (2002–2008) is the most infamous failed experiment.13 The Tate show’s design feels blandly beige and not particularly imaginative; too often non-European artworks (African sculptures in particular) are bunched together with relatively limited labelling in small glass vitrines. This is a far cry from the lavish ‘The Lure of the East’ with its elaborate ‘Orientalist’ dark jail-esque screens and dimmed lighting. Whilst ‘Artist and Empire’ wants to bestow upon non-European visual cultures a more ‘central’ place in the narrative of empire, by isolating representative artworks in the centre of several of the galleries endorses a sense of peripheral alienation. In several instances the display of non-European artworks smacks of Raj Victoriana. By being placed either side of Benjamin West’s full-length portrait of explorer/botanist/rake Sir Joseph Banks a Polynesian half-staff (‘Taiaha’) and paddle (‘Waka Hoe’) become little more than allusions to similar objects in the painting or worse still mere trophies. Such ‘framing’ of a large scale European oil painting reduces non-Western objects to mere supplements (supplement not meant here in a Derridean sense!). There could certainly be more imaginative tactics for negotiating with ‘unruly’ objects: the ivory chess set from Murshidabad (c 785), whose pieces depict the English East India Company military and the army of Tipu Sultan of Mysore, might be pitted in intricate, cerebral combat rather than left lined up as if on dull, army (ornamentalist) parade.14 And regarding the Yoruba sculptures of Queen Victoria and her minions, the curators could have been inspired by anthropologist Julius Lips’ incessant collecting and commissioning of similar artworks as retort to the racisms of British colonialism and the Third Reich. Taking as his mantra ‘The Savage Hits Back’, Lips’ 1930s curatorial experiment illuminates the potential/immanent power of contact and sympathetic magic.15 The space between mimesis (read as appropriation) and mimicry (ridicule of whites – their appearance and maybe their art forms) elicits, as anthropologist Michael Taussig would have it, ‘mimetic vertigo’.16 Eccentric and animating, such a position is much needed in a show like this. With ideas of mimicry and mimesis in mind, I glimpsed a few attempts to locate late eighteenth- and nineteenth-century Indian and British artworks in ‘elliptical’, analogical or intimate relationships. A small section of the room on collecting situates the watercolours of Anna Maria Jones alongside Zayn ud-din’s masterful paintings. A highly skilled artist in exile employed by the Joneses in 1780s Calcutta, Zayn-ud din had to adapt his expertise in portrait miniatures to large scale natural history studies. No doubt an amateur like Lady Jones wished to approximate his meticulous skill. If there are connections to be made between many of the artworks in ‘Artist and Empire’ this is by free fall association. Free fall association throughout operates as a vague political and artistic disclaimer. It’s also not clear why the seven themes (Mapping and Making; Trophies of Empire, Imperial Histories; Power Dressing; Face to Face; Out of Empire; Imperial Legacies) take the order that they do or why particular objects are assigned to each. Room Two on collecting is a bit of a cacophony (in many ways imperial collecting was so heterogeneous, so it is almost justifiable). Shunted into one corner are Rudolf Swoboda’s portraits of three prisoners from Agra gaol coerced to perform their ‘hereditary’ trades before audiences at the Colonial and India Exhibition of 1886. Less obvious to the viewer is how a coercive prison culture undergirded nineteenth-century institutionalised art production in India and Britain.17 It seems somewhat ominous that Room Two’s inclusion of these images complies with Victoria’s whim to have the ‘craftsmen’ ‘collected’. One of the most problematic themes ‘Imperial Histories’ (Room 4) makes the claim that history painting is ‘an all-inclusive hybrid species of art’. From this perspective the highest academic genre is also the most ‘democratic’. While I disagree, it does beg the question of how British publics were complicit in the production and celebration of imperial brutality during both armed conflict and ‘war of the peacetime’.18 The overblown and frankly quite hideous works of Edward Armitage and Joseph Paton, are meant to embody the voyeuristic horrors of the Indian Rebellion of 1857–1858. But what about Indian resistance? The heroics of Nana Sahib and Lakshmi Bai? One thing which is pretty clear is post 1858 the British Raj took a hard line policy on racial segregation, insurgency and famine. As if to reassure the visitor possibly shocked by such kitschy depictions of brutality, the following room picks up the rather frivolous theme of what the curators term ‘Power Dressing’. No doubt intended to appeal to the readers of sentimentalist, Raj nostalgic popular history books on white Mughals etc, display-wise it is all a bit of a dressing up box. Arguably the most controversial aspect of ‘Artist and Empire’ is its attempt to bow graciously out of the task of representing empire – a tone set by the rather misleading sound bite attributed to Rabindranath Tagore included in the wall text of Room 6. Here art is described ‘as a universal ideal that transcended divisions of nationhood, ethnicity and race’. Campaigning hard against the worn out norms of colonial art schools and the dangers of certain emergent forms of nationalism (India and Japan) Tagore’s ‘universal idea’ was in fact channelled into his engagement with the Bauhaus, Bengali folk arts and pedagogy at his university in Santiniketan. It can hardly be used as umbrella rubric for the bewildering diversity of artworks intended to best represent nationalist and postcolonial responses to British imperialism. This is where tokenism really kicks in: it’s as if ‘Out of Empire’ (which brings to mind ‘Out of Africa’ rather than decolonisation) is a mini world’s fair of paintings by a few of the artists who moved to London in the 1950s and 1960s including Sydney Nolan, Aubrey Williams and Donald Locke. This is also the one place in the show where dialogue between non-European and European art is made explicit in the labelling (eg Isabel Rawsthorne’s Three African Figures, 1961). Unfortunately, the final stages of the show merely demonstrate the curators’ negligence of the politics of decolonisation. Where is the aggressive racism of Enoch Powell’s chilling ‘Rivers of Blood’? And the sense of disillusionment, disaffection and alienation of migrant/exile/diasporic artists in Britain? What about cultural apartheid, exclusion from the mainstream and the formation of politically charged artists movements and collectives? Is there a ‘sly multiculturalism’ still at stake? It’s Sonia Boyce’s Lay Back, Keep Quiet and Think of What Made Britain so Great from 1986 which provides the most prescient critique of the exhibition as a whole. Playing with a quadriptych format, Boyce splices caricatures of imperialist propaganda posters (India, Australia and South Africa) with Victorian style wallpaper. Throughout ‘Artist and Empire’ artworks sometimes feel like old wallpaper but without the knowing gaze of Boyce’s watchful woman – possibly a former colonised subject. Sonia Boyce, Lay back, keep quiet and think of what made Britain so great, 1986. 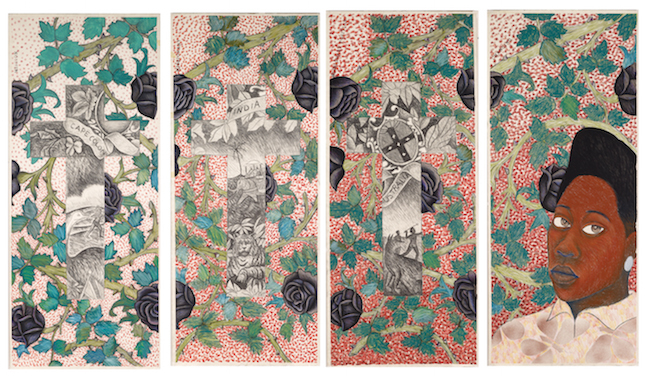 4 parts, each, 152.5 x 65cm. Charcoal, pastel and watercolour on paper. Arts Council Collection, Southbank Centre, London © Sonia Boyce. All Rights Reserved, DACS 2015. As an after note, wading through the typical show-related souvenirs found in any museum shop, the book shelves offer a glimpse of the real political issues at stake. Alongside popular, sometimes jingoistic histories of empire is a very limited selection of the iconic revolutionary and postcolonial texts by Frantz Fanon, C L R James, Edward Said. Poignant is their silence. 2 There are rumours of some controversy concerning the title of the exhibition which had initially been slated as ‘Art and Empire’ as a follow up to the Tate Britain conference of 2001 organised by Tim Barringer and Geoff Quilley. Throughout the wall texts in the exhibition the British Empire is referred to simply as Empire. 3 While collecting and displaying what they termed ‘idols’ – former objects used in worship, British evangelical missionaries frequently referred to such objects as rubbish. Today these objects are often kept at the margins of collections – for instance the Leysian Mission Museum, Hackney where non-European objects are mostly unlabelled and uncatalogued. 6 For commodity racism see, Anne McClintock, Imperial Leather: Race, Gender and Sexuality in The Colonial Context, Routledge, New York, 1995. 7 Tate Britain commemorated the 200th anniversary of the abolition of slavery with a small show ‘1807: Blake, Slavery and the Radical Mind’. 8 For artists’ responses to indentured labour see the recent show ‘Juxtapositions: Re-envisioning the Indian Labour Diaspora’, Centre for the Study of Developing Societies, Delhi, 26 March – 2 April 2016. 10 See W J T Mitchell, What Do Pictures Want? The Lives and Loves of Images, Chicago University Press, Chicago, 2004. Mitchell’s chapter ‘Empire and Objecthood’ was presented in a slightly different form as the keynote speech at Tate Britain’s 2001 ‘Art and Empire’ conference. 13 The Director of the Empire and Commonwealth Museum Gareth Griffiths was accused in 2012 of disposing of many of the museum’s objects without authorisation. When I visited this museum in 2008 I was the only visitor. The display did at least attempt to broaden out from just oil paintings and ‘high’ cultural forms. 14 Satyajit Ray’s classic film The Chess Players (1977) uses chess playing in Lucknow on the eve of British attack as an allegorical device to address the demise of nawabi and city culture. As a passing comment, one of the Fante Asafo flags (Gold Coast, 1910s–1940s) critical of British colonialism hanging rather high up in ‘Artist and Empire’ Room 1, includes a game of chess. Possibly chess could be taken up as a theme of resistance in a different context. 17 Saloni Mathur, India by Design: Colonial History and Display, University of California, Berkeley, 2009; Arindam Dutta, The Bureaucracy of Beauty: Design in the Age of its Global Reproducibility, Routledge, New York, 2006. The floor of the famous Ceramic Staircase at the South Kensington Museum (present day V&A) was laid by English women prisoners. Natasha Eaton teaches eighteenth- and nineteenth-century British art and the visual culture of South Asia at University College London. In 2015 she was awarded a Leverhulme Trust Research Fellowship which will enable her to undertaken research on her new book project The Conditional Image. She recently received a travel grant from the Paul Mellon Centre which she will use in order to be able to travel to India and Mauritius in relation to this book.